Could spending time outdoors, volunteering or simply taking some time out for yourself be the antidote to blue Monday and the January blues? The UK’s leading conservation charity, the National Trust, believes these things may hold the key. The Trust has investigated a few of the reasons why we suffer from the January blues and, for those who are feeling a little off colour this month, have come up with a few suggestions of how you can turn your month around. In what’s being called the Me Time challenge, the Trust have identified ten things you can do from taking a winter walk and wildlife spotting to a touch of retail therapy and even having a beer. Each of the suggestions is aimed at improving health or happiness by suggesting new things to see, do and learn, or by indulging yourself in a treat or two. 1) Spend time outdoors – despite the cooler weather there’s no reason to stay indoors in the winter. A winter walk is obviously good for your health, but it’s also a great time spot different species of wildlife like migrating birds. Head to the Northumberland Coast or inland to Hadrian’s Wall. 2) Try something new – have you been promising yourself you’ll get on a bike for ages, or take up running? The Trust has some great places for you to start out including running events and activities at Gibside or join the Park Run on The Leas in South Tyneside. 3) Release your inner child – the Trust’s 50 things to do before you’re 11 ¾ activities can be enjoyed by big kids as well as little ones. The list includes everything from star gazing and going on a nature walk at night, to climbing a tree and making a home for a wild animal. 4) Tuck into afternoon tea – what could be more indulgent than a scone with jam and cream? Pop into the Trust cafes at Wallington or Gibside and treat yourself to something delicious. 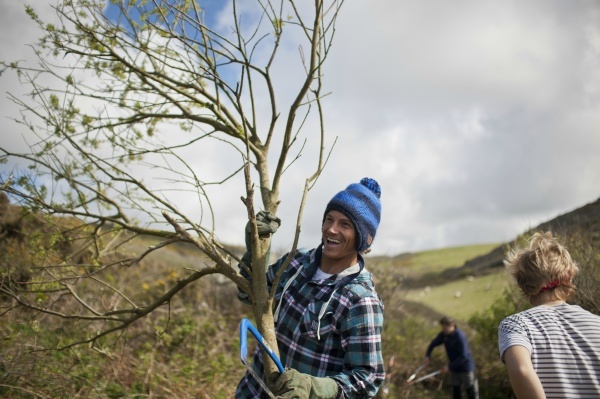 5) Do something for others – the National Trust, like all charities, simply couldn’t exist without volunteers and supporters. Whether you support by giving your time as a volunteer, by visiting, or joining the National Trust as a member, you can do your bit to look after some of the North East’s best bits of coast and countryside as well as houses, castles and gardens. 6) Indulge in some retail therapy – January is a great time to pick up a bargain in the shops. There are some lovely treats in store in Trust shops at Wallington and Gibside. 7) Have a beer – did you know the National Trust has its very own beer club? Members benefit from the expertise of master cicerones (that's beer tasters to you and me) who are specifically tasked with finding beers of the highest quality and real distinction. 8) Learn something new – delve into the stories that helped to shape the North East as it is today by learning a little more about the people behind the places cared for by the Trust. If you’ve been meaning to visit somewhere for a while, or find out more about its history, make a commitment to do it today. 9) Book a holiday – January is a prime time to plan your annual getaways. If you haven’t booked your summer holiday yet, check out National Trust holiday cottages or pop-up campsites for some inspiration. It’s always good to have something to look forward to. 10) Take a day off – when was the last time you took a day off to do something just for you? Whatever you do with your day off, we hope the suggestions above might give you a little inspiration!